84 Possible Fibromyalgia Symptoms | Troy C. Wagstaff aka CallahanWriter Blog: Topics of interest include Western Historical (1865-1899) Topics. Additionally inspirational Christian and Fibromyalgia interests. Of those who respect fibromyalgia as a legitimate medical condition, most of them associate chronic wide spread pain as the primary symptom. Some also recognized chronic fatigue and fibro fog as additional symptoms. But what many do not realize or appreciate about fibromyalgia is that there are more than 82 symptoms that go along with fibromyalgia, either as a primary symptom or overlapping secondary symptom. Also consider that many of these symptoms can be unrelated to fibromyalgia and could easily be symptomatic to other types of illnesses or diseases. This list is presented as something to think about and as information you may want to talk to your doctor about. This list of fibromyalgia symptoms are alphabetically ordered. Vision changes (including rapidly worsening vision)This list is for informational purposes and is not a diagnostic aid. Always consult your health care provider for any diagnosis or treatment of any of the symptoms. Hi Brandi, I was wondering if you knew the resource of his findings? Were there only 48? Or are they located somewhere else? What dup’s are you talking about? Really great information, I never knew. I have almost all. Which is scary. Im medically Retired from the Military. 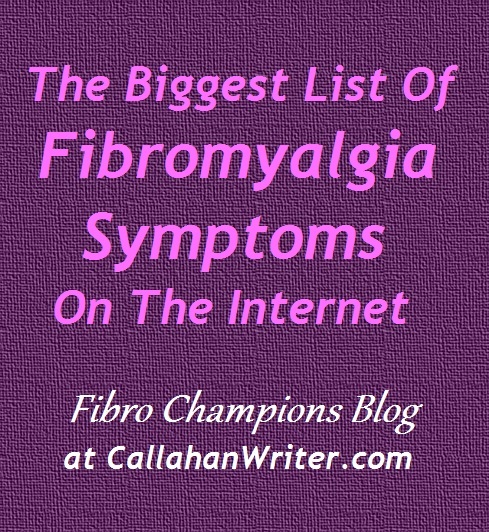 They never dx with fibro, It wasn’t until 1 yr 1/2. To be dx, by a civilian doc. I did notice there were a couple of repeats of symptoms listed. Is there supposed to be different? List of symptoms I have been able to connect with so many that I never knew were connected to fibro! It is a pain full stop! Never knowing what the next day will bring. Probably worst for me is not knowing why I ended up with this illness. However I will be damned if I will let it control me. Never giving into it is what keeps me going. I’m really glad I read the post thanks. 36 / 84 ? Whats the average for non-fibro?